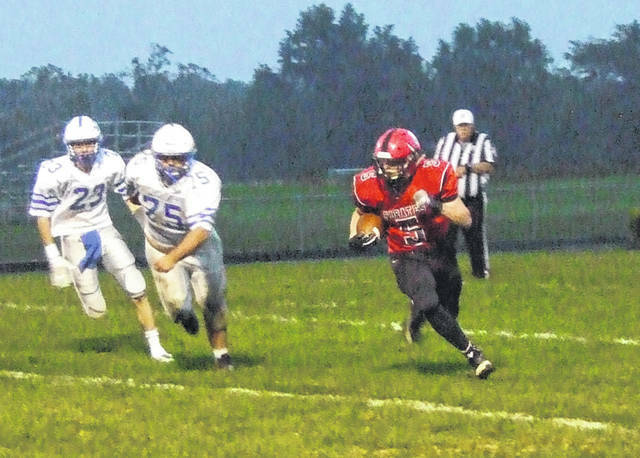 Cardington’s Mason Goers looks to outrun members of the Danville defense on his way to a 150-yard performance Friday. A few plays here and there could have meant all the difference for Cardington in their 27-14 home loss to Danville Friday night. In the contest, the Pirates advanced deep into Blue Devil territory twice in the second half, but came away with no points. Also, while Cardington was unable to capitalize on any of Danville’s three turnovers, their opponents turned two of Cardington’s three into touchdowns. After Danville opened the scoring with a game-opening 10-play drive that resulted in a three-yard running touchdown by Christopher Greenawalt to stake them to a 7-0 lead, the Pirates immediately fumbled the kickoff to give their guests the ball again. Fortunately for Cardington, that would be the turnover their opponents couldn’t turn into points, as they fumbled the ball right back to the Pirates, giving them the ball on their own 13. After getting a first down on an 11-yard run by Mason Goers, though, the drive stalled and Cardington was forced to punt. Danville got the ball at midfield and wasted no time in taking advantage of their good field position, scoring in four plays with Langdon Johnson crossing the goal line on an 18-yard run to make it 14-0 late in the opening period. Cardington would strike quickly to cut their deficit in half, though. After returning the ball to their own 39, the team got back-to-back six-yard runs by Goers and quarterback Nate Hickman to set up a 29-yard run by Goers that moved the ball to the Devil 20. On the final play of the opening period, Hickman hit Trey Brininger in the end zone and Brandon Steckel added the PAT. Neither team could maintain any offense in the second quarter until an interception gave Danville the ball on the Cardington 11 with only 2:25 left in the half. Quarterback Dalton David would connect with Corbin Hazen from five yards out to make it 21-7 with 1:22 remaining. The Pirates would move fast again to keep the game close, though. Starting from their own 35, three rushes and a defensive holding play moved the ball into Danville territory at the 39. Goers then burst for runs of 11 and 13 yards before Hickman connected with Brininger again, this time for a 15-yard touchdown. Steckel’s kick brought Cardington within a 21-14 score going into the half. Both teams traded punts to open the second half, but Cardington looked good on their second drive of the third quarter, as Brininger returned a punt to the Danville 32. A 12-yard run by Goers moved it to the 20 and a five-yard pass to Brininger and four-yard run by Goers got it to the 11. However, facing fourth-and-one, the team committed a delay of game penalty and then missed a 33-yard field goal to come away empty. The defense looked like it would bail them out and force a punt, but Cardington then muffed the return and the Blue Devils returned it. This time, they would not be stopped, driving 26 yards and scoring on the opening play of the fourth quarter on an eight-yard run by Nathaniel Wilson to go in front 27-14. Cardington attempted to battle back, advancing the ball deep into Danville territory on the legs of Hickman (three rushes for 27 yards) and Goers (four for 23). However, facing fourth-and-two from the 12, they’d throw an interception and their opponents would be able to run out the clock. Goers finished the game with 150 yards, while Hickman added 33 on the ground and 52 through the air, with Brininger catching four passes for 46 yards. After the game, Plumley felt his team just needed to put plays together to finish drives with more consistency.